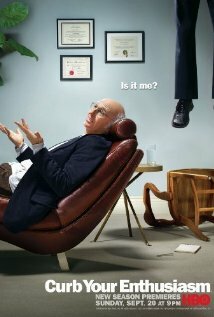 With Curb your enthusiasm, Larry David, creator of Seinfeld, delivers one the most original comedies in current TV. The concept is brilliant - instead of hiding behind a character, David decides to lend his own image and voice to the scripts of the show, with a result that is part fictional series, part reality TV. Many of the episodes are based on the author’s actual experiences and acquaintances in Hollywood, which makes the show more believable, and also more hilarious. The stories don’t have a classical beginning or an ending, and usually shows us Larry during a number of days, interacting with the world and displaying his particular opinions and behaviours. One of the vignettes show him him buying some weed from a street dealer (played by Jorge García, of Lost fame) to “try a new experience”, but instead of being discreet during the buy he’s extremely awkward. In another episode, he tries to avoid a charitable act to which he’s been invited by Michael J. Fox, and ends up spending two month in Paris, which of course is much more inconvenient. The episodes feature many other guest stars that greatly enhance the attrative of the show. Through Larry’s eyes, we’re able to see the absurdity of many of the conventionalisms of today’s society. He’s a rebel of shorts, but he usually has to pay a price for it. Of course, some of the troubles he gets into are caused exclusively by his obsessions, that lead him to make a big fuzz over insignificant things, echoing what we saw in several of Seinfield’s characters. If you remotely enjoy acid comedy and humor in the vein of Woody Allen, you’ll probably have a heartful laugh with Curb your enthusiasm.